If your dog has a life anything like mine does, you have to admit that he’s a member of the family. At dinner time, all of the humans sit on nice chairs at a beautiful wood table. But poor little Frankie eats out of a bowl on the floor. It’s time to change that. 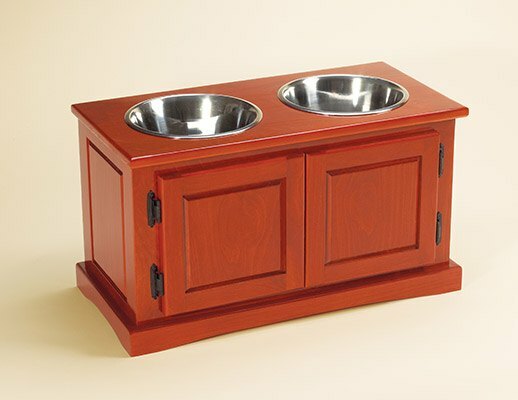 My thanks to the folks at Minwax for giving us this tremendous design for a dog feeding station. Now, Frankie gets to eat in style and the rest of the family is envious. Check out our essential tools list for every advanced carpenter. Note that this piece is designed for medium to large dogs. If your fluffball is a little one, downsize accordingly. If the cabinet gets too small, you may have to skip the doors and leave the front open. There are 32 pieces to be cut from our single board and half-sheet of plywood. 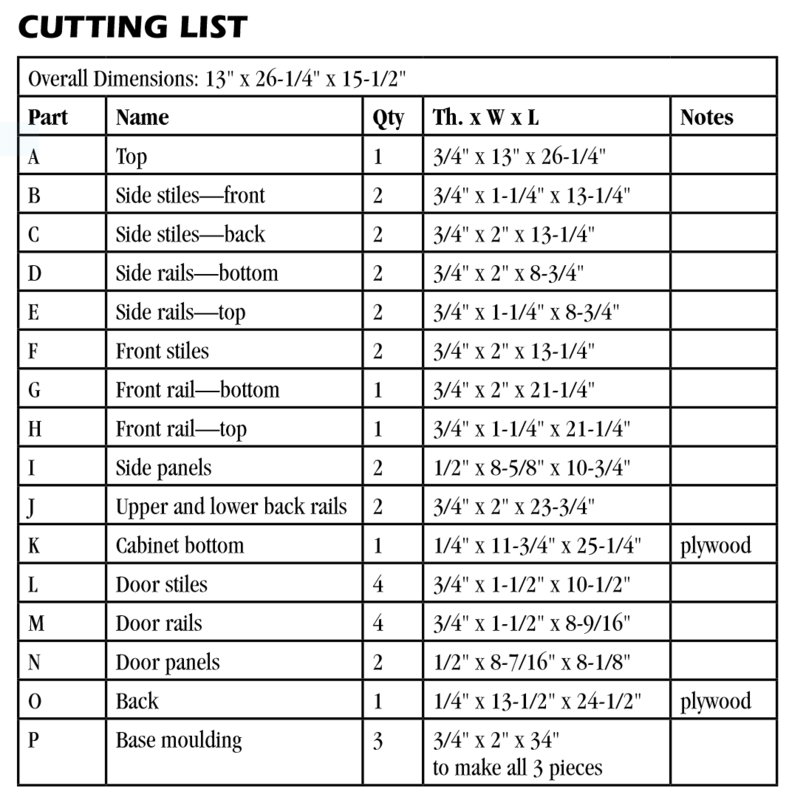 See the cutting list for the details. The next drawing provides an exploded view of the entire assembly to help make sense of the cutting list. Once you have rough cut all of the pieces, machine them to size. Measure the total diameter of the bowls you are going to use, including the width of the lip (these are 10 inches). Then measure the width of the lip, double that number and subtract it from the overall diameter. That’s how big you should make the holes in the top. Our 10” bowls have a 3/8’ lip. So we double that, which is ¾” and subtract it from the 10” total diameter. That means I had to use a jig saw to cut two 9 ¼” holes in the top. Now create rail and stile joints on frame pieces B, C, D, and E with a tongue-and-groove router bit. Create the groove in all 8 pieces, and the tongue on the grain ends of the 4 rails. With a thickness planer, plane the side panels (I) to ½” thickness, and machine the edges to fit the grooves and create the raised center effect. Note: Allow about 1/8” of space on the rail ends to allow for seasonal expansion of the panels. Then glue the pieces together, making sure they are perfectly square and flat. Remember that you have two sizes of stiles, so glue them together in the proper right and left configurations. While the ends dry in their clamps, let’s build the frame. Drill 2 pocket holes inside each end of the front rail (G) and one in the top rail (H). Yes, I know the diagram shows 2 pocket hole screws in the top rail. It’s a mistake. (Better to make the mistake on paper than the real piece, right?) Use 1 ¼” pocket hole screws to assemble the front frame. Now cut two biscuit slots on the front edge of the side frame pieces and the back side of the front stiles. A good measurement is to cut these slots two inches from each end. 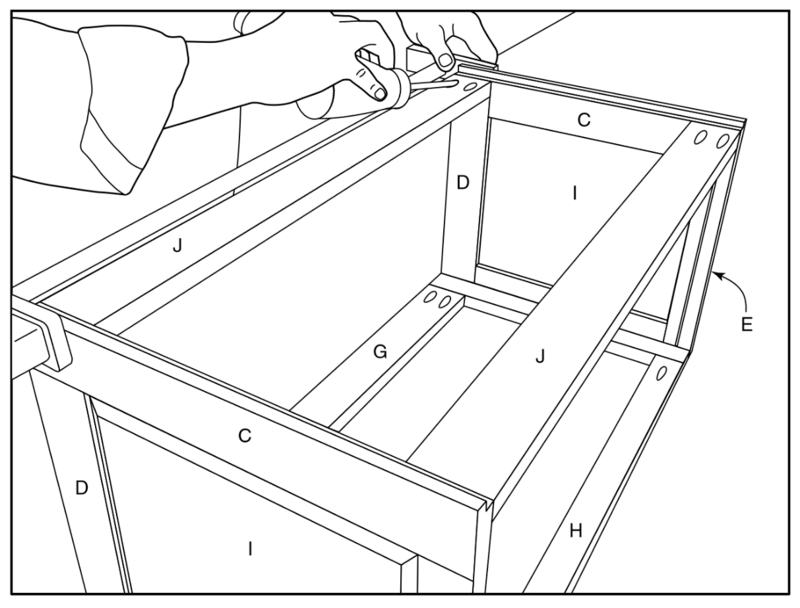 Also make a rabbet cut on the back edge of the two side frames for the cabinet back (O). 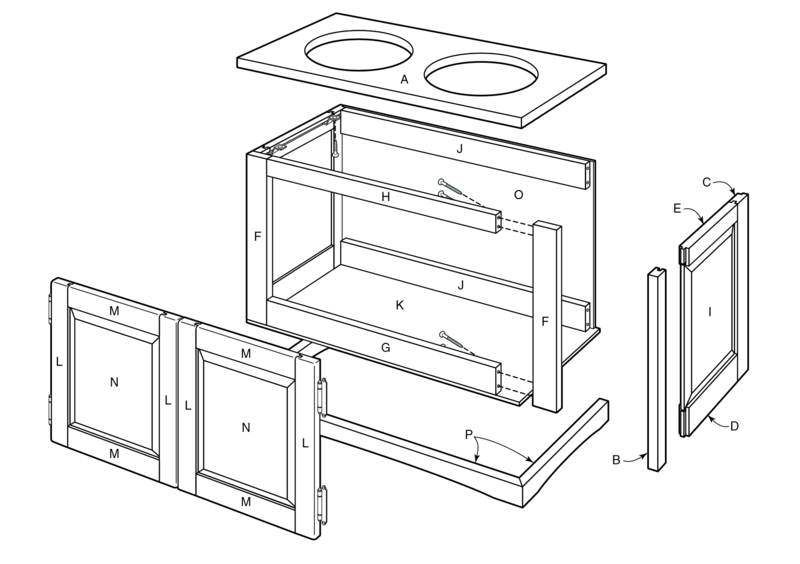 Now dry assemble the sides and front frame and double-check measurements for the upper and lower back rails to make sure your cabinet is perfectly square. Machine the back rails to fit. Glue the side panels to the front, using biscuits for extra strength. Drill pocket holes in the back frame to match what you did on the front and attach them to the sides. Create the doors in the same fashion as you used to build the sides. Now, let’s build the base molding. After cutting the molding pieces to the proper lengths, use the router table to apply a ¼” round-over to the top edge. Create perfect miter corners for the base moldings, one corner at a time. A good tip is to leave each piece long on the other end, so that you can re-mit7er a corner if needed. Cut the back end of the molding square with the back of the cabinet once the front corners are perfect. 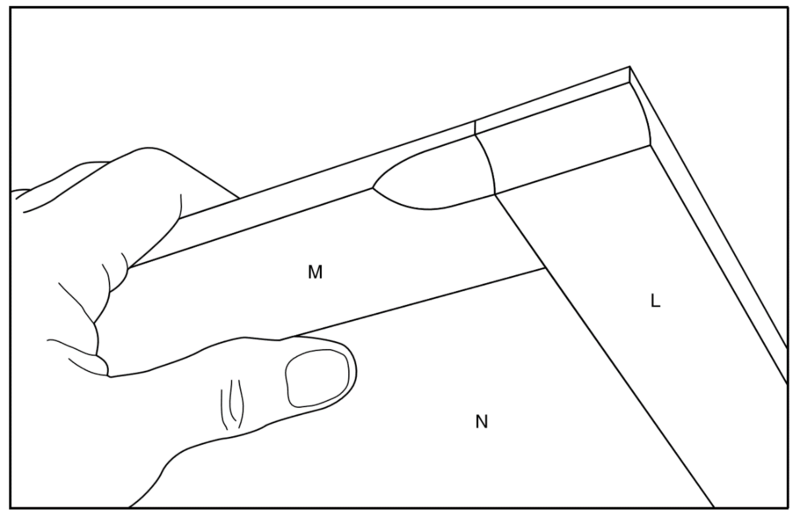 Draw a curve to the bottom edge of the base moldings using your preferred method. I take a small strip of hardwood and bend it into a bow shape. While I hold it against the molding, I have another person draw the outline on the molding piece. Then, using a band or jig saw (I prefer the band) cut the curve and sand it smooth. Glue and clamp the molding in place and secure it with wood screws from the inside of the front and side framing pieces. With the router, cut a little cove on the top inside corner of each door, to act as a pull. Alternatively, you could mount door pulls on each door. Mount the hinges about two inches from the top and bottom of the doors, making sure to pre-drill all of the holes. Allow about 3/32” space between the doors to allow for free movement. Cut and install the cabinet bottom and back from the ¼” plywood. Lay the top upside down on your bench and the cabinet on top of that. Install the tabletop fasteners according to the requirements for the hardware you have selected. Sand everything completely and apply the stain or finish of your choice. Do not secure the bowls in the frame because you will want to remove them for cleaning. If you have cut the holes perfectly, they should rest snugly in the holes, yet lift out easily for cleaning. This is actually a fairly complex build for something as seemingly simple as a stand for a couple of dog bowls. But here’s why I suggest building it. I view this piece as an introduction to cabinetry-making. It calls for extremely precise measurements, detailed woodworking with complex concepts and equipment, and the kind of attention to detail that cabinetry-makers take for granted. Frankly, if you can build this cabinet for your little Frankie, you can build any cabinet. And if this is your first attempt at cabinetry and you make a few little mistakes along the way, well, I don’t know of anyone more forgiving than the family pooch.